Met at Bluebird Park at 8:30 and after about 20 min. SWRR flew in and landed in the very dark area under the bridge, then up to feed. He then fed several times in the next 10 min., mostly going upstream. And his mate joined him in feeding. At 3rd bridge no sign of a bird for 10 min. then Mr. Green appeared with food and went up to the nest. The female remained unseen for the 20 min. we were there. 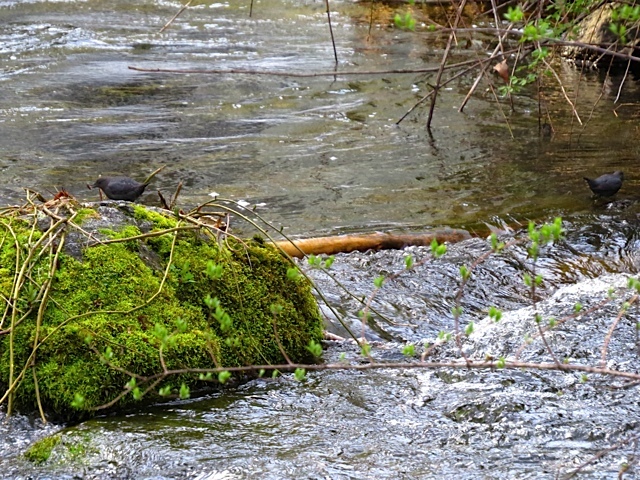 And at 1st bridge there was no sign of a dipper so Eric went down the bank to look and saw them both; one on the nest and the male (we assume) close by and moving around but always out of our sight from above. Not sure if there are chicks yet. But it looks like the male is going to hang out where he can’t be seen and we will have problems knowing what is going on unless we get down to look under the bridge.